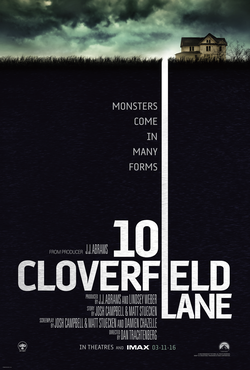 I never saw the original Cloverfield film, and I wasn’t the slight bit interested in seeing this UNTIL I started seeing the positive reviews rolling in. That surprised me, especially because I’d expected it to be some kind of a B-movie/brand cash-in. Whodathunk? At the heart of this film is the question: can a man be both crazy and correct? It’s a fascinating conundrum, and provides a roller-coaster ride. I loved the back and forth on the veracity of Howard’s claims, and I have to be honest, I really didn’t know whether to believe Howard (superbly portrayed by John Goodman) or not. One things for sure: dude’s CRAY-ZAY! For me, storytelling is best when it doesn’t attempt to tie up all of the loose-ends, at least not immediately. I loved the way this film left so many things unexplained while still resolving the central conflict. Almost makes me wish this story were getting a prequel AND a sequel. Hey JJ Abrams: nice touch on Michelle’s escape through the hatch in the ground. A nod to the Season 1 cliffhanger from Lost, perhaps? Absolutely loved the way they connected this story to a much larger apocalyptic story. As popular as cinematic universes have become, we rarely see films set in said universes that deviate from the standard blockbuster “must save world from utter destruction” narrative formula. Nice to see a studio take a chance on such a deviation and succeed both critically and financially.